Made with nutritious coconut flour, these GF muffins are tropically delicious! Their taste is similar to pineapple upside down cake! Mmm! Preheat oven to 350 degrees. Line a 12-cup muffin pan with 8 paper liners. In a small bowl, mix together the coconut flour, baking soda and salt. In a large bowl, whisk together the eggs, kefir, maple syrup, butter and vanilla extract. Add the dry ingredients to the wet and whisk well to combine until no lumps remain and batter is thick. Then, add a few pieces of diced pineapple to each muffin cup. Next, place another spoonful of batter on top of the pineapple, making sure to evenly distribute the remaining batter among all the muffin cups. 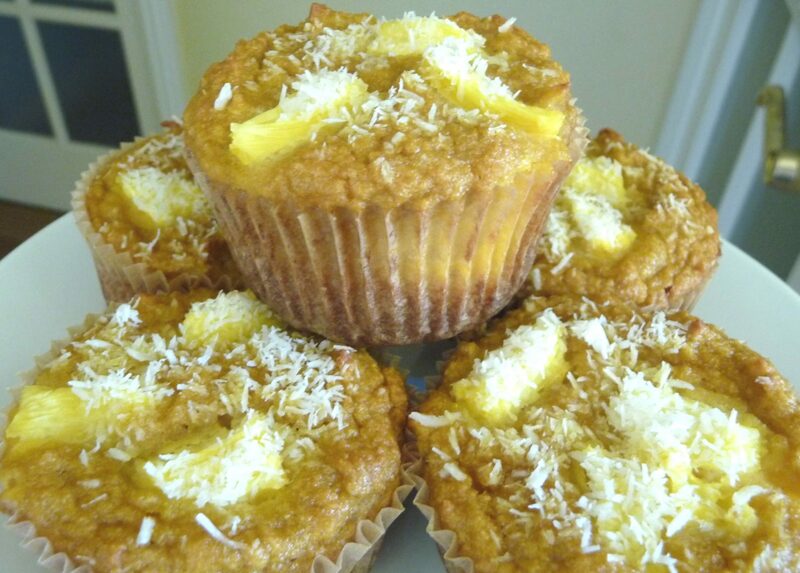 Finally, add more pineapple to the top of each muffin and sprinkle lightly with a few pinches of shredded coconut. Bake for approximately 22-25 minutes, until top and edges begin to turn a light golden brown. Allow to cool in the pan for 5 minutes, then serve. Enjoy! Honey Butter Biscuits made with LOVE! We tried someone elses’s coconut flour recipe months ago and it was horrible, so I was a little afraid of the coconut flour here, i’ll admit. These are delicious and light and fluffy. The family loves them and doesn’t know they’re eating grain free! I commented on FB too, because I just want everyone else to know that your recipes are outstanding and the answer we’ve been looking for! You haven’t steered us wrong yet, just amazing. Thank you. These are AMAZING! I can’t get over how good these muffins are! I love your website and so far every recipe I have tried has been really good. Stumbling across the 2 week meal plan has made switching my family over to whole foods so easy and delicious. Thank you!! I made these the other day but using banana instead of pineapple (I was out). I figured it would be me and my kids eating them. I’ve been looking for a winning GF muffin for a while with no luck, but this is it! Not only that, but my super picky husband loved them and wanted me to make more! I will be mixing up the fruits to see if there are any that don’t work (strawberries are next since I have some that need to be used up), but this recipe is absolutely a keeper! Thank you so much! I sure do, here’s the secret … use “If You Care” brand muffin cup liners. They are THE BEST – nothing sticks (you just have to let the muffin cool completely) and they are great for you and the environment too! I only use these because they are that good! I get them through my Azure Standard co-op, but have seen them at Whole Foods and of course available online. Hope this helps! Happy Thanksgiving! Thank you! I bake a lot of double and triple batches and freeze so that I have plenty of easy and quick breakfasts so I will definitely try these out! I read the comments for these and decided to make them even though I was hesitant about the coconut flour. I had some in the fridge, but hadn’t liked the recipes I had tried so far using it. Well, I made these and they are SO good. My husband said “These CAN’T be healthy.” 🙂 Great recipe! Very easy, too. I added some coconut to the batter as well and used 1T of coconut oil and 1T of butter instead of just butter, and added some ground flax this time around. Last time I made exactly as the recipe says, and both are delicious. Thanks! Do you suppose that I could make this as a bread instead of muffins? (I would double the recipe and increase the cooking time) I’m fairly new at using coconut and almond flour, so I’m not sure if it would work the same way that all purpose flour would, and I don’t want the recipe to go to waste! Just wanted to let you (and others) know that I have successfully doubled this recipe, and cook it in a 9 inch cake pan, for the same time and temp as the muffins. I then use it as a base for our strawberry shortcake breakfasts! 🙂 It also freezes well this way. So glad to hear this worked without butter or yogurt. We have dairy issues here so I was thinking of trying coconut oil and almond milk but wasn’t sure it would turn out okay. This gives me hope! Thank you so much for all you do to help people like me prepare healthy foods for the family! I have always been scared of experimenting in the kitchen but am getting much more comfortable because of websites like yours. I tried this recipe this morning and my 10 year old is raving about it. I didn’t have pineapples so I used blueberries and it worked out great. Thanks again for all you do. These are great! The only problem I am having is eating just one. 🙂 I am new to coconut flour baking and this recipe is fantastic, even my husband who does not touch my other healthy undertakings liked them. Hi, I think I’ve already told you how much I love these muffins! I do have a question, though. How do you keep them from day to day without freezing? If I leave them out on the counter or put them in the fridge, they give off a lot of moisture. We usually eat the batch in two to three days, so freezing and thawing doesn’t seem to be the most efficient solution. Any advice? Thank you! Thank you. That’s great advice. I’ve also taken to wrapping in paper towels during storage and that’s been working really well. these are the best!!! call me lazy but i threw all the “wet” ingredients in the blender and then added the dry. blended everything into a batter and poured. (my kids don’t like chunks of pineapple -or pineapple for that matter) but these were a HIT!! thank you! These smelled amazing while they were cooking, but I was kind of disappointed in them. They were kind of crumbly/gritty and eggy tasting. I don’t know if I did something wrong, or if I’m just not used to the taste–it’s the first time I’ve used coconut flour. Thank you for taking the time to share these healthy, real-food recipes with us. It has been really helpful as I try to transition my family to healthy whole foods. We don’t have any gluten issues, so I do think that if it’s just that I’m not crazy about the coconut flour, I’ll just try adding the pineapple and coconut to my basic whole wheat muffin recipe. Either way, you’ve given us something new to try. To be fair, I have a cold and everything tastes “off,” so that may be it. I’m looking forward to trying one again in the morning for breakfast. It really wasn’t that I didn’t like them, but more that they didn’t live up to their smell (which made my house smell delightful!). My husband said that he thought they were as good as they smelled and then some, so my family will definitely be enjoying these again. Wow! These were incredible – I didn’t have any pineapple so I substituted frozen mango. These were the best gluten free anything that I have ever tried! Your recipes have never disappointed. Thank you so much!! 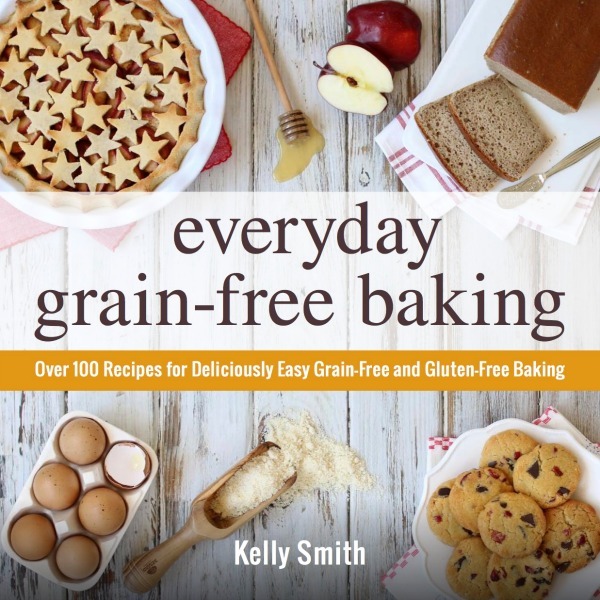 Thank you for posting such a great recipe Kelly. Hi! Should I use full fat coconut milk? Thinking of these for my son’s first birthday! Really good. came out well and easy to make. i like the healthy ingredient list, i love coconut flour and high protein recipes! thanks!